SANMAN Promotions will have their first salvo for 2017 on February 26 at the Lagao Gym of Gen.Santos City. Four title belts will be at stake with Sanman’s Jade Bornea (6W-0L,4KO’s) headlining the event against Raul Yu (9W-1L-2D, 8KO’s) of the ALA Gym for the vacant IBF Youth super flyweight title. Bornea had an excellent amateur career, having won a bronze medal at the AIBA World Youth tournament and is a two-time Asian Youth gold medalist. He owns the distinction of beating future WBO world champ Kosei Tanaka when they were amateurs during the finals of the 2013 Asian Youth championships held in Subic Bay, Philippines. He scored stoppage wins in last two pro fights. Yu’s last three fights have ended by the short route since he had back to back draws in 2015. 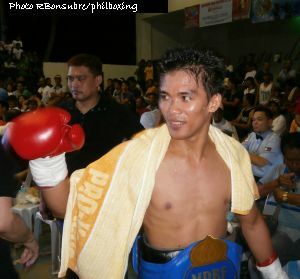 His only loss was against Jeffrey Concerman in Murcia, Negros Occidental by unanimous decision. Three World Boxing Federation (WBF) titles will also be disputed showcasing Sanman fighters Eden “Sanman” Sonsona (35-6-2, 12 KOs), "Iron" Ben Mananquil (12-1-2, 3 KOs) and Lolito “Thunder Shot” Sonsona (20-1-4-, 9 KOs). Eden, a former WBC International Silver super featherweight champion, will face Jovany Rota (9-9-0, 6 KOs) for the World Boxing Federation (WBF) International super featherweight crown while his younger brother Lolito from the Jason Soong boxing gym will be pitted against Renren Tesorio (15-9-3-4 Ko’s), a former Philippine light flyweight title-holder, for the vacant WBF Asia super flyweight crown. Mananquil, on the other hand, fights former WBO Asia-Pacific bantamweight champion Glenn “The Rock” Porras (29-5-0, 17 KOs) for the WBF International bantamweight crown. Former WBA interim world light flyweight champ Randy Petalcorin is also penned to see action in a non-title contest against Mark Anthony Florida. Rounding up the card are unbeaten ‘Magic” Mike Plania vs Jetly Purisima, Jayson Mama vs Jeffrey Alejandre, Ernie Sanchez vs Richard Betos and Ou Yu Zhou vs Holly Quinones. “Laban Pinoy 3: Rise of the Champions” is the official boxing event of this year’s Kalilangan Festival. It is presented by Sanman Promotions and Solar Sports. It is sponsored by the city government of Gensan, Mt. Sabrina Resort, Barberlife and Amoy Promotions. Admission is free to the public.